Calendar spring has arrived, but the real thing is still peeking around the curtain, trying to decide when to make its appearance. We’ve gone from cold to cool, but haven’t arrived at warm. And that’s fine with me. No, really! I’ve always found spring to be an anxiety-producing season. So much to do and not enough time in which to do it, never mind savour and observe. Weeds to weed, plants to plant, seeds to seed. And grass to mow. Last spring — my first as a job-free (i.e., retired) person — came on fast and hot. Right from the start, I felt I had missed the garden bus with no hope of catching up. The weirdness of leaving my years-long work routines, combined with hot (30 C, 86 F) days in May threw me off balance. I found myself shelving ambitious plans for the garden and improvising. This year is different. I’ve worked through most of my Things to Prune list and made good progress on the Plants to Move one. I’ve seeded half a dozen perennials (inside) and of course the tomatoes. Most of them are starting to sprout. Tomatoes aside, it’s been years since I bothered growing new plants from seed. 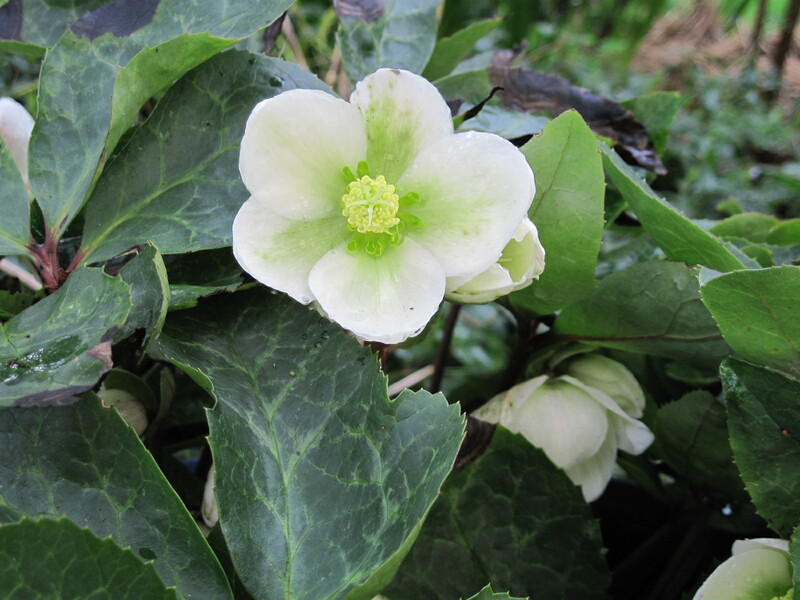 Finding literally hundreds of hellebore seedlings around one of my mature plants, I potted up a few dozen. 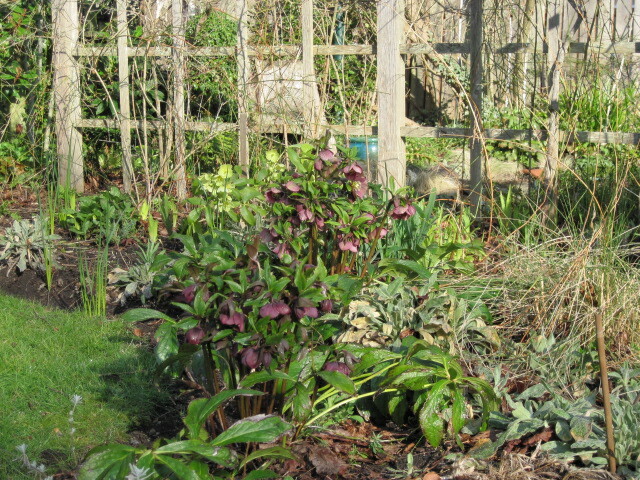 Hellebores do quite well here, so my plan is to make them more of a feature in a couple of beds, replacing plants that are struggling. The parent plant is a rather dark, smoky purple; it will be interesting to see what colours its offspring produce. These cool, often cloudy days are perfect for doing strenuous stuff in the garden, such as digging up perennials and moving them to new, supposedly better spots. Preparing the new spots, of course, usually involves cutting and removing part of the network of tree roots that lurks just below the surface. I also have a lot of compost to distribute — shovel into wheelbarrow, shovel out over the ground. (When I think about it, compost is an awful lot of work — rake up the leaves and stuff, pile it up, poke it and turn it, and finally shovel as above, probably returning much of the material — in a decomposed state, of course — pretty much to where it started from. Nature probably laughs at gardeners). In between all these efforts, it’s good to wander around and see what the plants are up to. That, after all, is the reward. Spring hit really early this year on southern Vancouver Island. I’m still trying to catch up. Things in the garden are racing ahead. 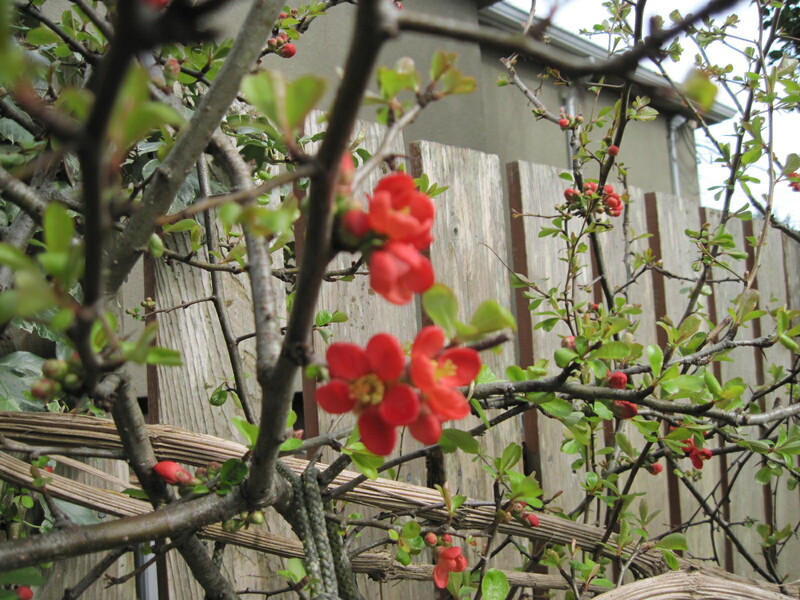 I saw a note in my garden and weather book from April 24, 2013: Apple tree starting to bloom. This year, the apple tree has finished blooming. The flowers have faded and leaves are growing (as yet uneaten by little green worms). A couple of weeks ago, it looked like this. 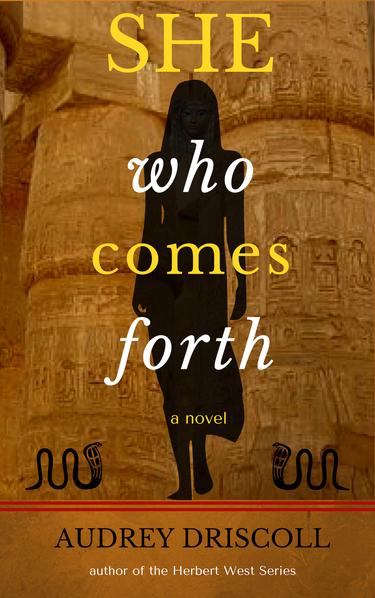 So we are three to four weeks ahead of schedule (assuming nature has a schedule, which is doubtful). The garden is almost through its blue-and-gold period, now that the daffodils are finished. 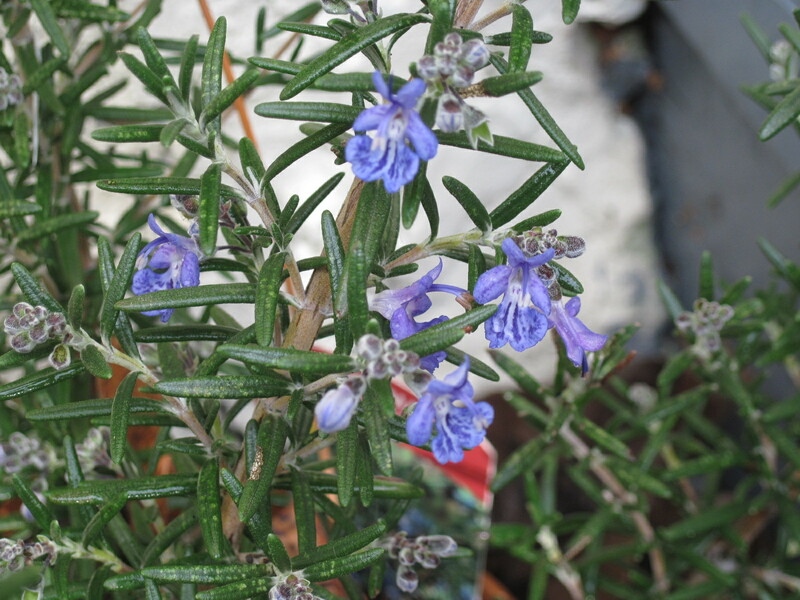 Blue is still dominant, what with bluebells (Scilla), forget-me-nots and abundant rosemary flowers. But the star of the show for me is the single blue poppy (Meconopsis), a triumph after no blooms at all last year. There is one more bud. The other blue poppy plants don’t seem to have any plans to bloom, but with blue poppies you are grateful for whatever you get. 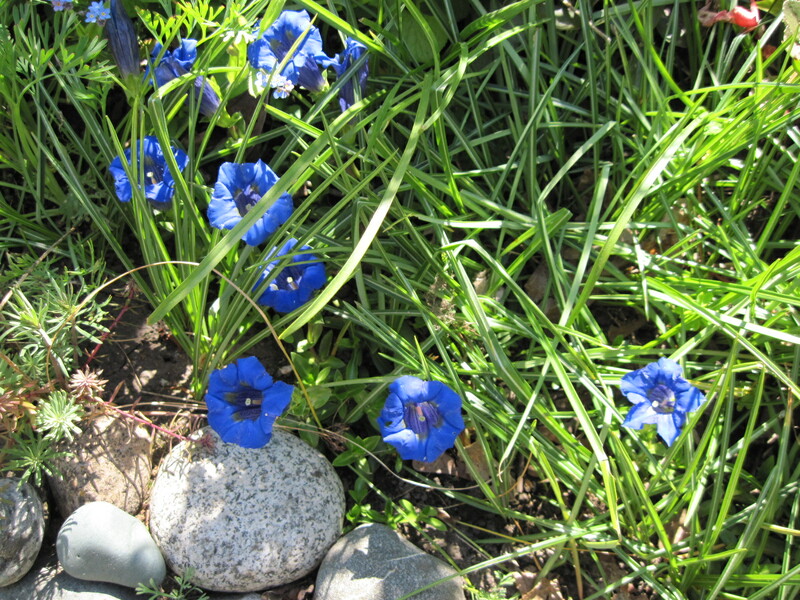 The so-called “neckless” gentians (Gentiana acaulis) are more dependable. I suspect the buds of my main planting were nibbled by deer, but these young transplants are performing well. 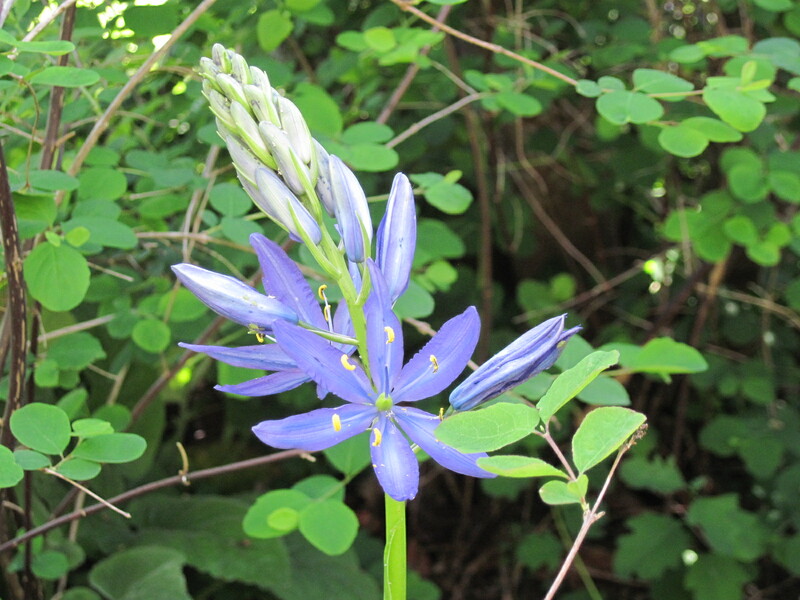 And I’m happy to report that the great camas (Camassia leichtlinii) are also in fine form, showing lots of buds. One especially tall plant is already in bloom. And there are roses! Roses in April! (And blackspot starting too, I see. In gardens, perfection is to be sought but rarely attained). Readers may have noticed an absence of garden-related posts recently. Well OK, it’s been winter, but here on the Fortunate Coast you could have been fooled into thinking spring came very early — or winter cancelled itself soon after Christmas. 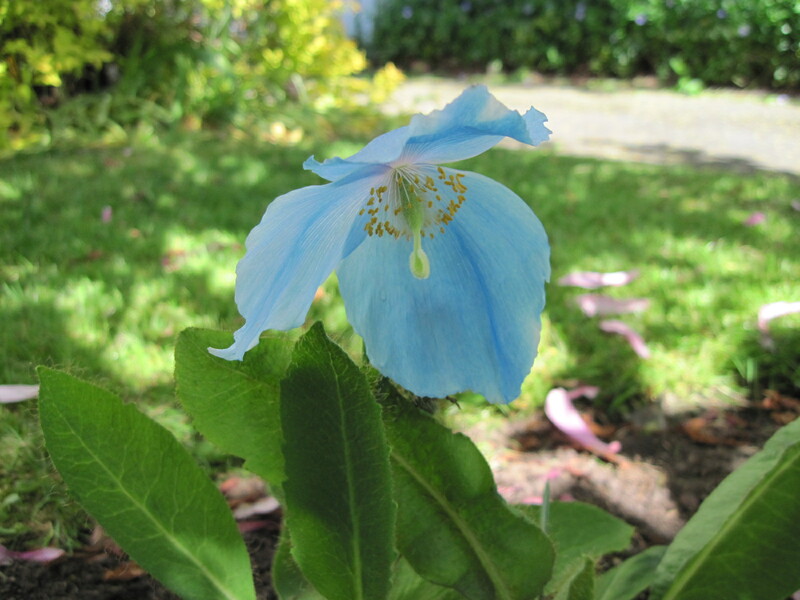 For the past three weeks I have been checking for emerging blue poppies (looks like 10 or 11 of the 16 plants have survived) and pruning shrubs. The cotoneaster, ceanothus, one of the barberries and the magnolia have undergone well-intended amputations. I’ve cut down old perennial stalks left over from last summer and pulled up some of the invasive grass from the perennial bed that is slowly being taken over by it. But I feel disengaged from the garden and I’m not ready to embrace spring. Part of me would be happy enough to have a couple more months of winter. The reasons for this are clear — some challenging family issues and the presence of The Dog. I have less time and energy for the garden. 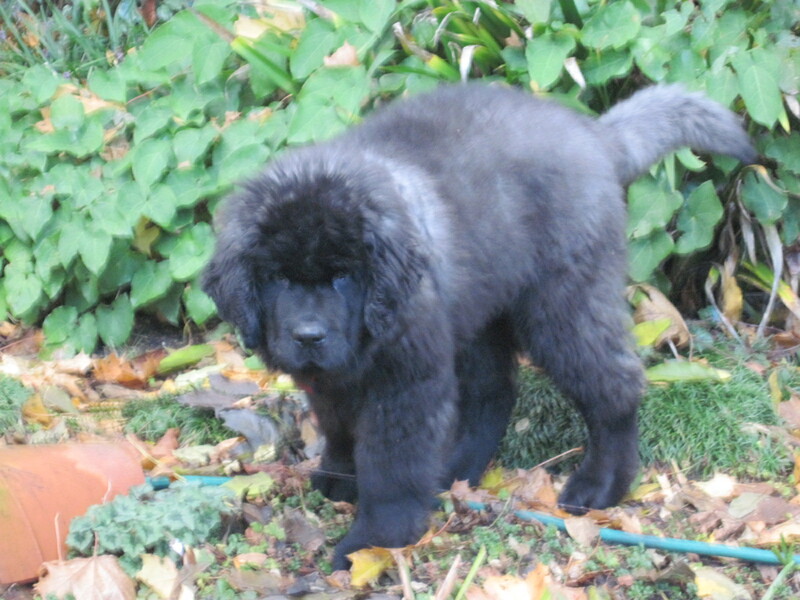 Moreover, I’m still coming to terms with sharing the space with a large, bouncy puppy who chews sticks and fallen branches and occasionally does some unauthorized digging. 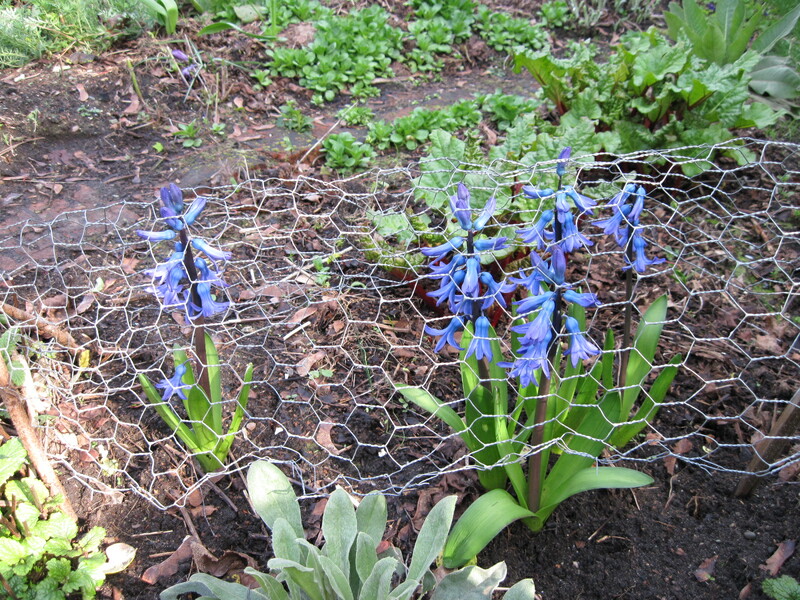 Fences around the beds protect the plants but are visually jarring. I have no ambitious plans for the coming season. Maintaining the status quo will be the name of the game, and I’ll be quite pleased if things don’t deteriorate. 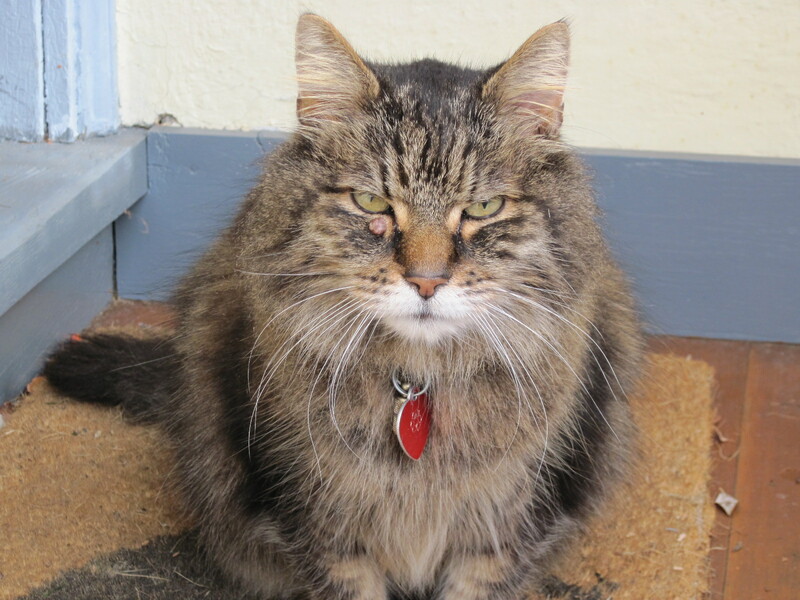 No new beds will be dug (except by Nelly), no exciting plants introduced. I may even skip the long-established ritual of growing tomatoes. The fewer pot-confined plants I’ll have to water every day or two in the dry months (May or June through September), the better. This is one of the dark secrets that garden writers don’t reveal — a garden can’t be put on “pause” while the gardener takes a time out, unlike a hobby using inert materials. Plants will grow and seed and die quite happily on their own, unsupervised by the gardener. But many of the features the gardener values will be lost or diminished — integrity of plantings, clear edges around beds, and survival of delicate or fussy plants. One reads of the disheveled charm of abandoned gardens, but it’s different when the garden is your own and you get to witness the dishevelment creeping in. So I hope the 2015 gardening season isn’t one where chaos reigns and the gardener (that’s me) throws in the trowel. Blue is the colour of hope. It has been definitely spring-like here this week, after a winter that was rather unusual in some ways. I thought I would look through my weather records and get an overview of it — recognizing, of course, that compared to the cold, harsh conditions other parts of the country experienced, we on the west coast have little to complain about. Apologies for not providing the Fahrenheit equivalents for temperatures and inches for precipitation amounts. Just keep in mind that 0 C equals 32 F and 25 mm. is an inch. November was pretty moderate. Temperatures ranged from a high of 12 C to a low of -2 C. Winds were light to moderate most days, and rain was delivered in modest shots of no more than 10 mm. at a time, adding up to 67.5 mm., which is rather low. This was the beginning of a dry period of several months which caused some anxiety about reservoir levels and next summer’s growing season. Early in December, a cold snap began, which did not end until the 14th. On December 8, we had a low of -9 C. Though cold, this period was clear and sunny. Clouds returned as temperatures rose to normal values, dispelling hopes of a white Christmas. December 15, which has in former years been a dramatic weather day (windstorms and/or heavy rain), was quite temperate — 6 C to 10 C, with 2 mm. of rain followed by bright moonlight. The first snowdrops were in bloom on the 31st. January temperatures were pretty typical — ranging from -2 C (on the 4th) to a high of 10 on the 24th, which was a brief preview of spring. There were no major rain events; in fact the “winter drought” continued. Ski resorts on Vancouver Island feared for their season. I registered 89.5 mm. at my place, which was better than the 60 in January 2013, but followed two relatively dry months in November and December. February began with another cold period. On the 5th and 6th, temperatures stayed below freezing, with a low of -6 C on the 6th. 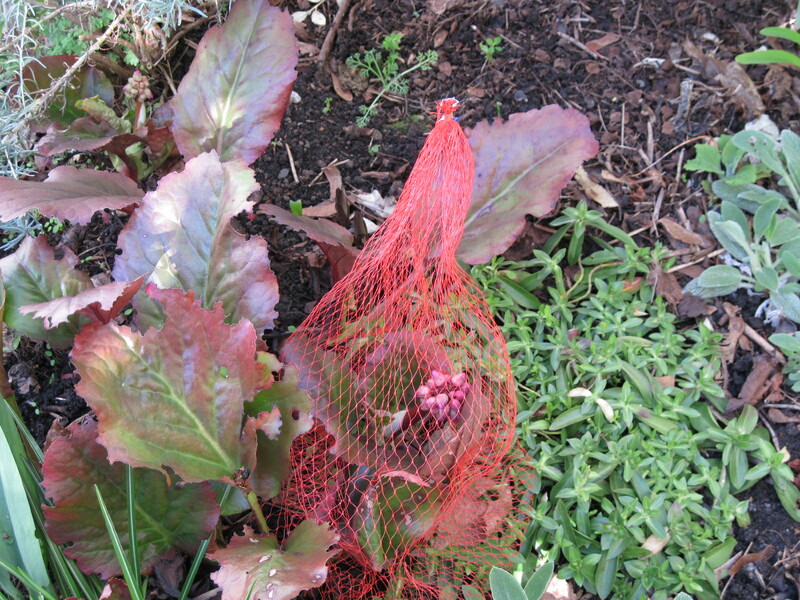 I find a note from February 9th: “Garden looks beaten down.” The big Corsican hellebores looked deflated, and the frozen state of the ground (surface only!) gave the whole scene a desiccated look. Snow would have been welcome, if only in an aesthetic sense. 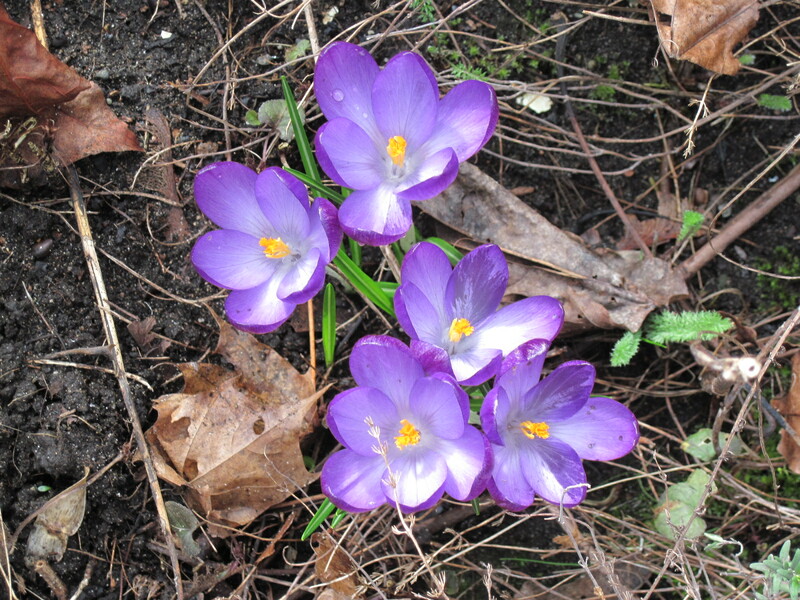 Crocuses and Iris unguicularis began to bloom despite the dismal scene, but the flowers looked slightly nibbled, as though by slugs, leaving tattered fragments on the ground. I never saw the culprits, preferring to stay inside wondering what kind of insect would be out in such inhospitable conditions. Finally the rains typical of winter began, delivering 125 mm. by the end of the month. 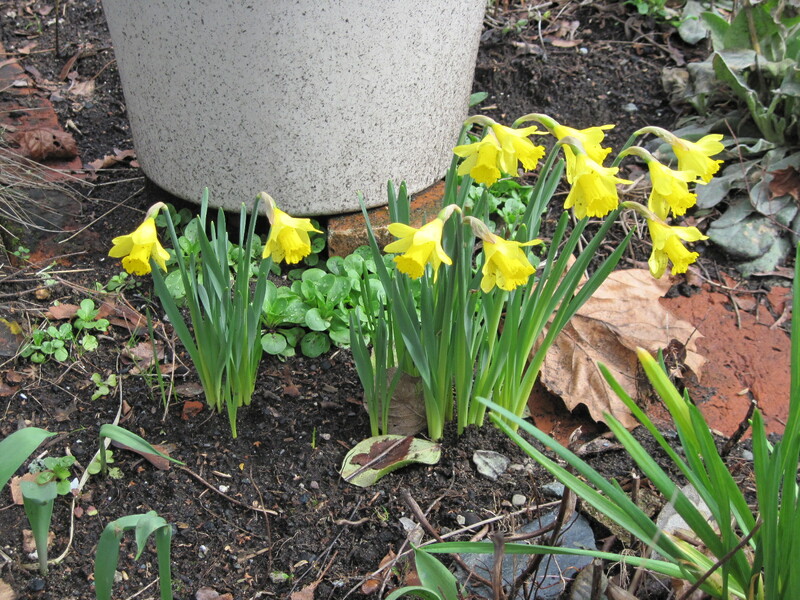 February 22 through 24 was a period of truly miserable weather — mixed rain and snow with a wind that made it seem colder than 0 to 4 C, but by the end of the month things were brightening up and spring seemed a distinct possibility. Considering that this garden is situated in an old, established suburb only a few kilometers from downtown, there is a surprisingly large population of wildlife. Yes, it’s the same buck as last March, with an injured foreleg. It seems the injury is permanent, but it doesn’t stop him from jumping fences and finding plants to eat, leading to desperate measures. Otherwise, there are the usual wonderful things. This is an odd combination, but quite colourful. 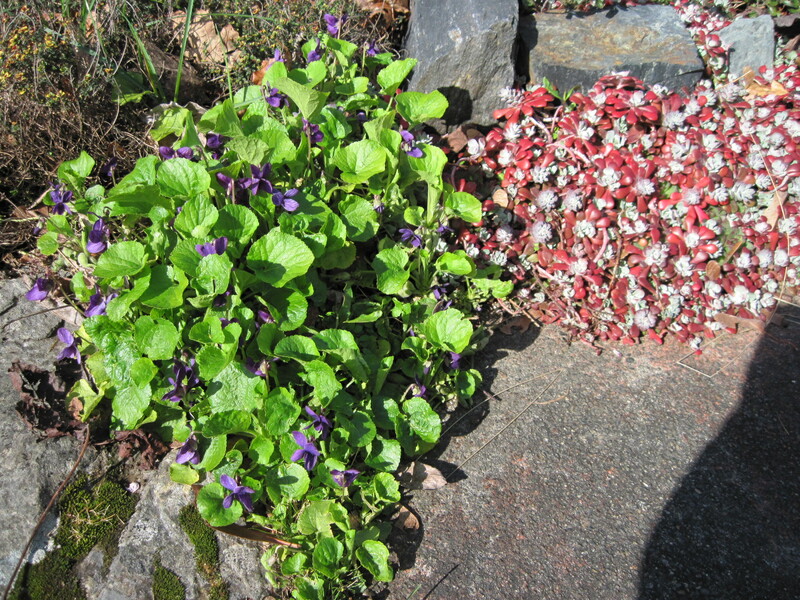 The violets have spread throughout the garden and the scent can be overwhelming on a warm spring day. The buck likes them too, but they are tough and don’t seem to mind being nibbled. I replaced the terra cotta pots with plastic ones that should hold up better when the plants get knocked over by strong winds. Note the deer-nipped crocus foliage. Fortunately, they have no taste for Meconopsis. 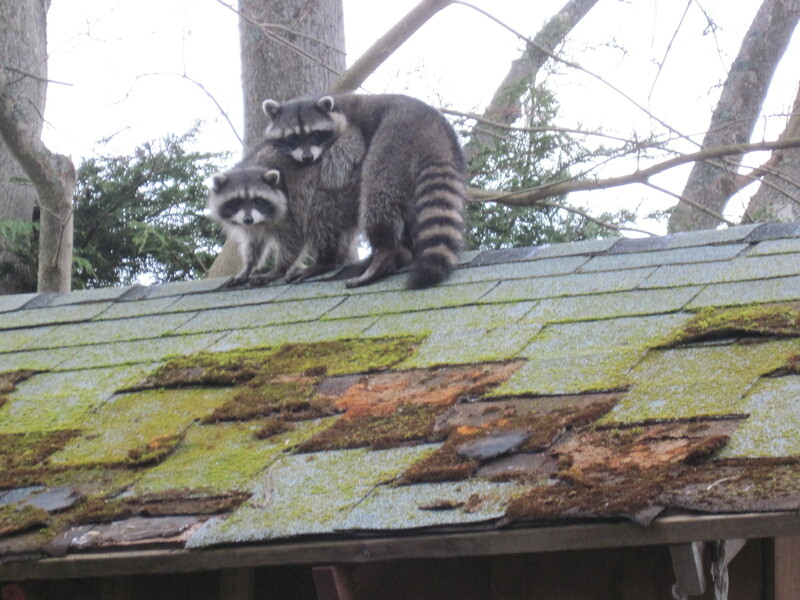 These guys aren’t just cuddling, which means there will be more of them rampaging around the garden, dumping rocks into the pond, digging holes and peeling shingles off the shed roof (which is what they were doing before this). Now it’s spring, both by the calendar and in reality. We’ve had several days this week with high temperatures in the double digits (just barely, though, unlike the mysterious East, where summer arrived early). With daylight lasting longer as well, it’s time to get back into the garden. So far, all I’ve done is wander around the place taking note of things that will need to be done eventually and picking up wind-pruned birch twigs and Ailanthus branches. 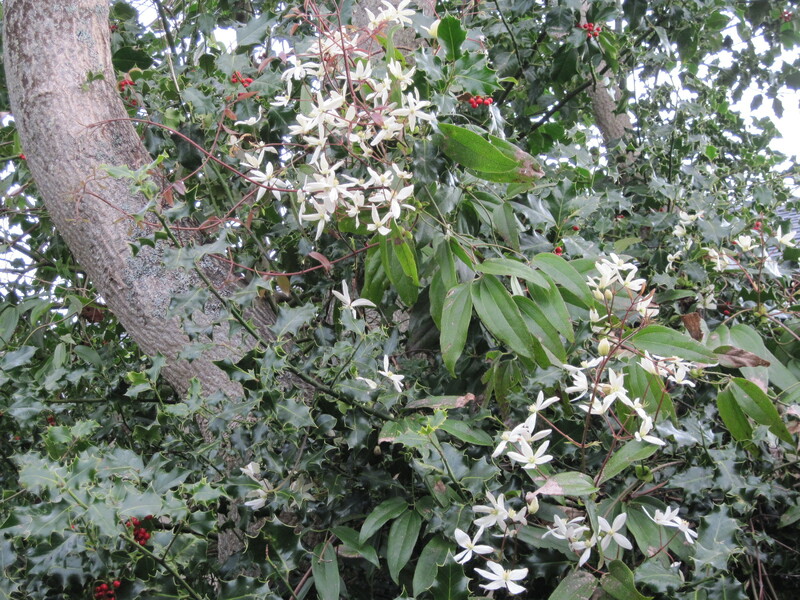 Pruning — I’ve also done some of that myself, notably whacking hollies down to a reasonable height and shortening the lollipop photinia by two feet to prevent it from getting too friendly with the power line from street to house. But that’s all. There are still some of last year’s dead perennial stalks around, even as the plants prepare to start growing anew. And I haven’t even planted tomato seeds inside yet, something I usually do in mid-March. It’s just as well that this spring looks like being cool and damp. Today an unexpected project came up — removing parts of an old white lilac that developed a westward lean after recent windstorms, exerting pressure on the metal pole that anchors the far end of my clothesline. 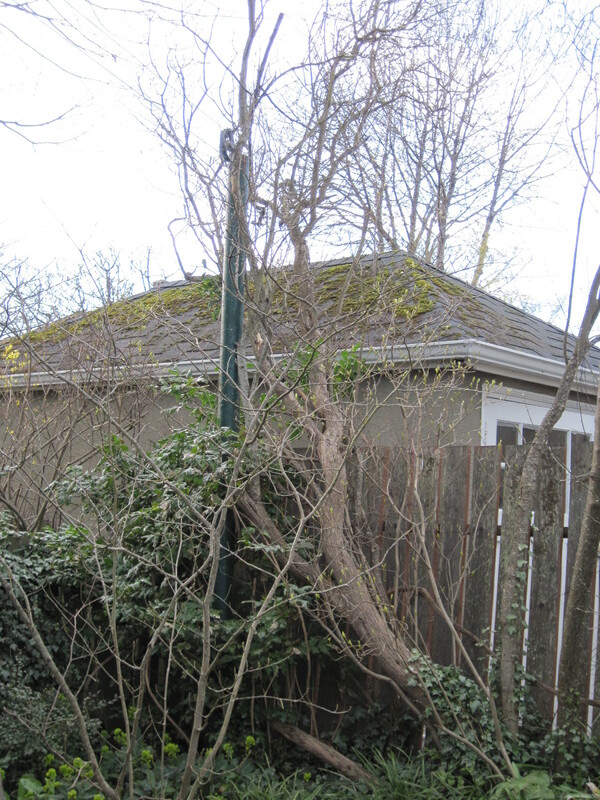 A section of the shrub now looms over a neighbour’s garage. I managed to extract several sections of the plant, liberating the clothesline pole and with luck reducing the possibility of further collapse for a while. I have noticed this tendency of old lilacs to keel over. Usually there are enough new shoots to keep the plant going, but this habit is something to keep in mind if your garden has a mature lilac bush. 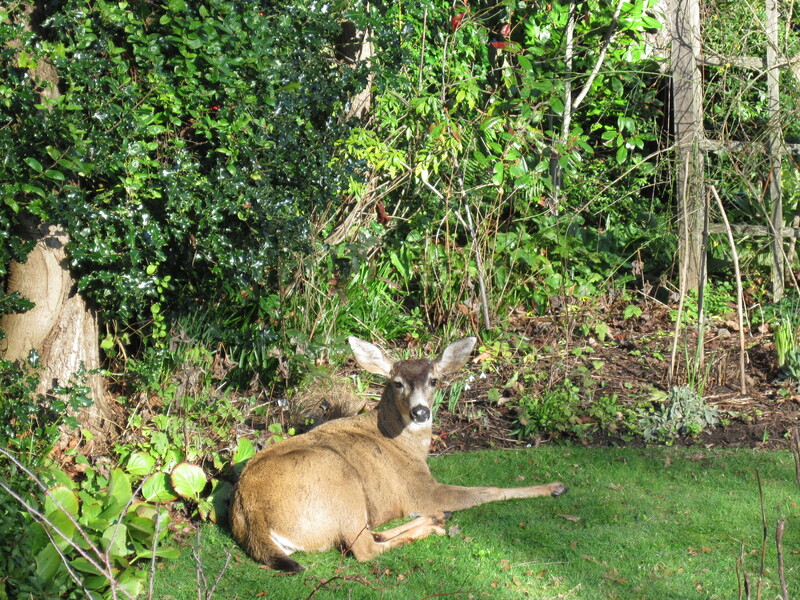 As if this garden needs more challenges, it has acquired a new one, in the form of the buck with the injured leg that turned up a few weeks ago. This week he was back, snacking on hyacinth blooms and tulip buds. Only the flowers of the hyacinths were eaten, but some of the tulips were reduced to half-inch stubs, so I wonder if they will survive. I can’t think of anything to do about this guy, since he can cruise the neighbourhood early and late, chomping plants while their owners are asleep or away at work. 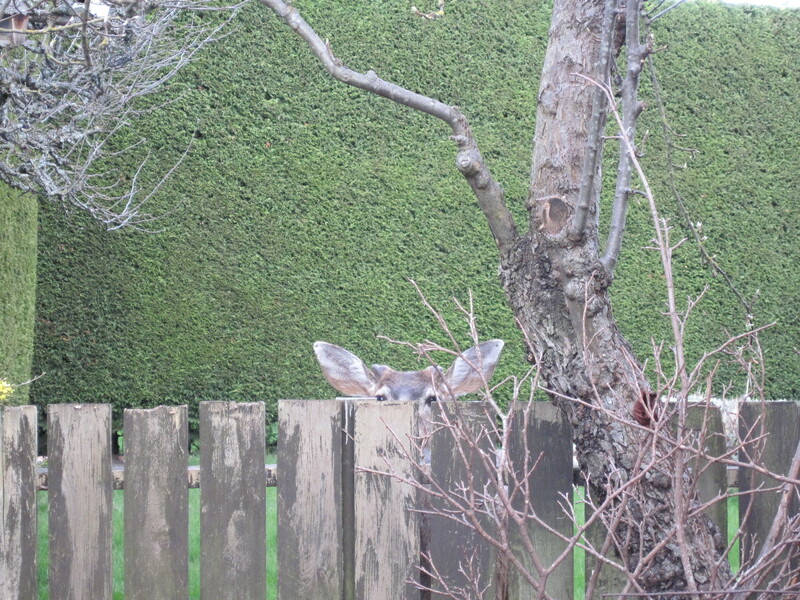 And he does add a certain excitement to the garden; I never know if I’ll see him out there. So back to the endless list of Things To Do — turn the mess of the ex-vegetable patch into a “herb garden,” distribute the old compost and “manage” the new compost, edge all the beds, start tomato plants, hoik out dandelions, cut the grass. And keep an eye on that buck. I have mixed feelings about spring, even this year as we emerge from a La Nina winter. We had two bouts of snow here, one in November and another in February. There was a lot of wind and rain in the first part of March, so it’s good to see longer days (a few of them sunny) and temperatures of more than 10 degrees C. (50 F). But I still find spring to be a challenge. For several months the garden has been quiescent, with last year’s memories preserved in pictures and vague intentions for the future. But with the coming of spring, it wakes up and makes demands. 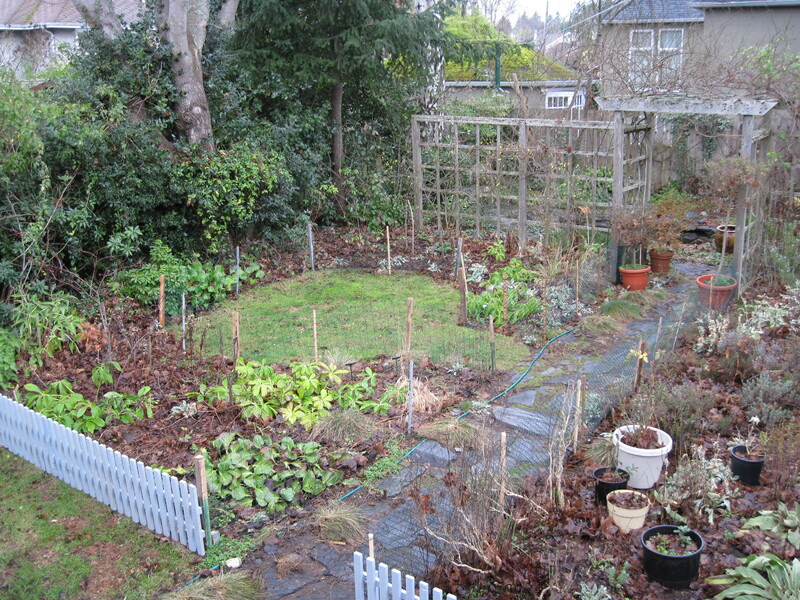 Or, to be accurate, plants in the garden emerge from dormancy and begin to grow. 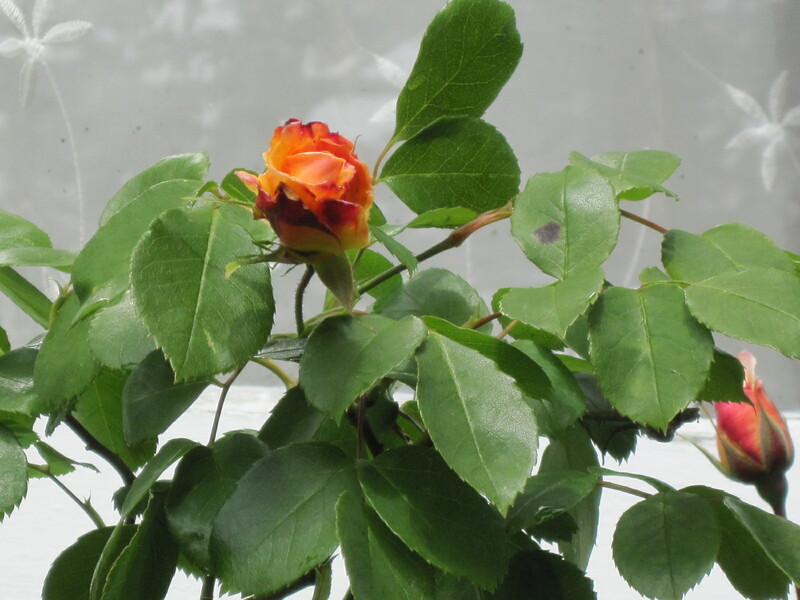 Seeing this, the gardener begins to make lists of Things To Do: prune roses and hollies, cut down old Epimedium foliage, edge all beds, seed tomatoes (indoors, of course), dig vegetable patch, and (as Henry Mitchell would say), zub zub zub. 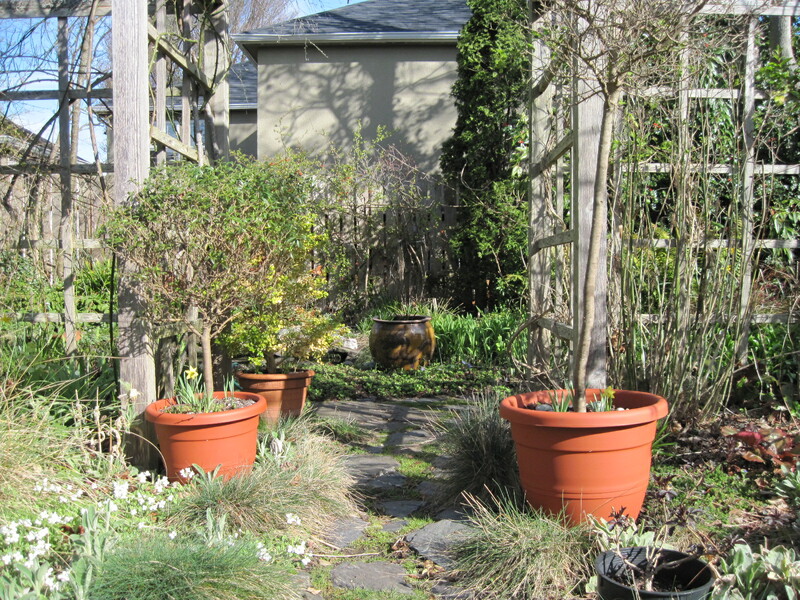 In spring, the garden stops being theoretical and becomes actual. Things that haven’t worked out can no longer be ignored. 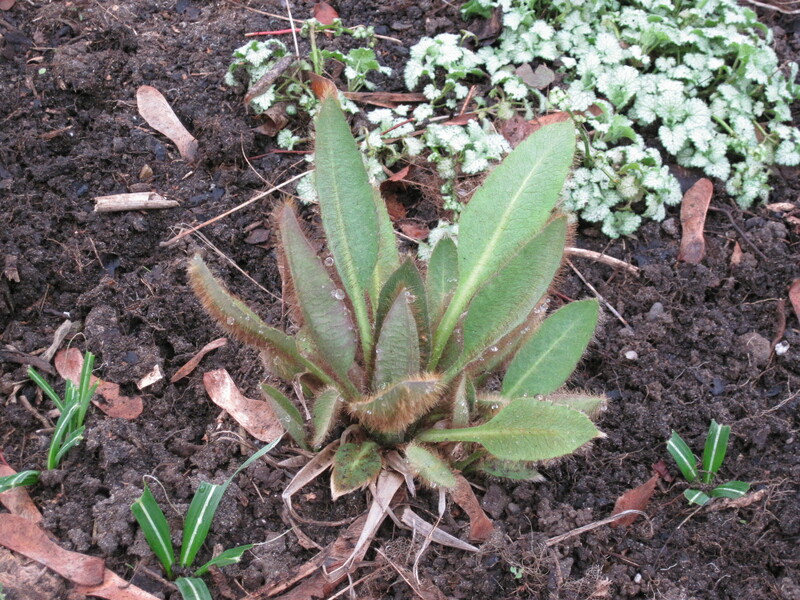 Six potted Meconopsis have sprouted out. The seventh has not, so must be dead, a possibility confirmed by judicious prodding around the crown of the plant. The hebes, which actually had a few blooms in January,now look dead, no doubt as a result of the snow and cold in February. 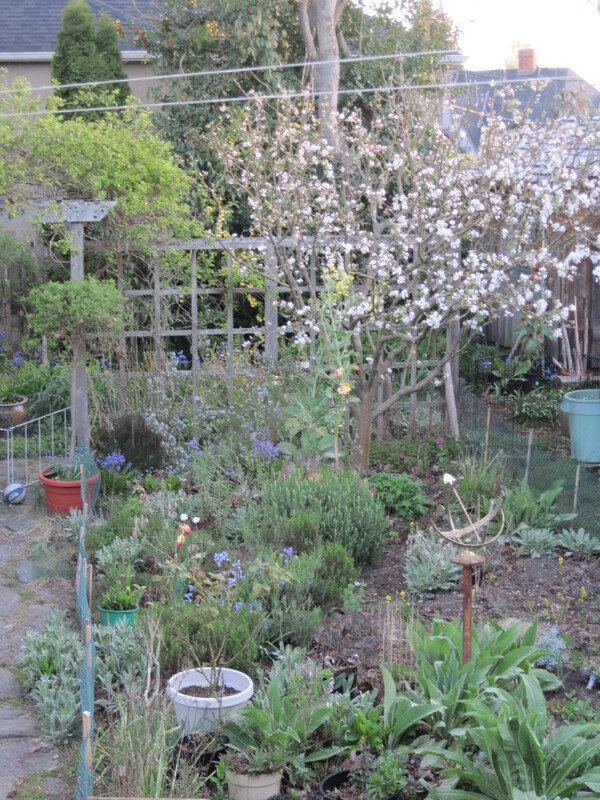 A large portion of the front garden is a mess — full of unwanted grass and renegade Campanulas. It adjoins the Bad Neighborhood and is starting to resemble it. Something must be done, and soon. That’s the thing — certain garden tasks are best done now rather than later (which so often translates to “never”). If the invading grasses are ignored, they will gain a few more yards and the weeding job will only get bigger. 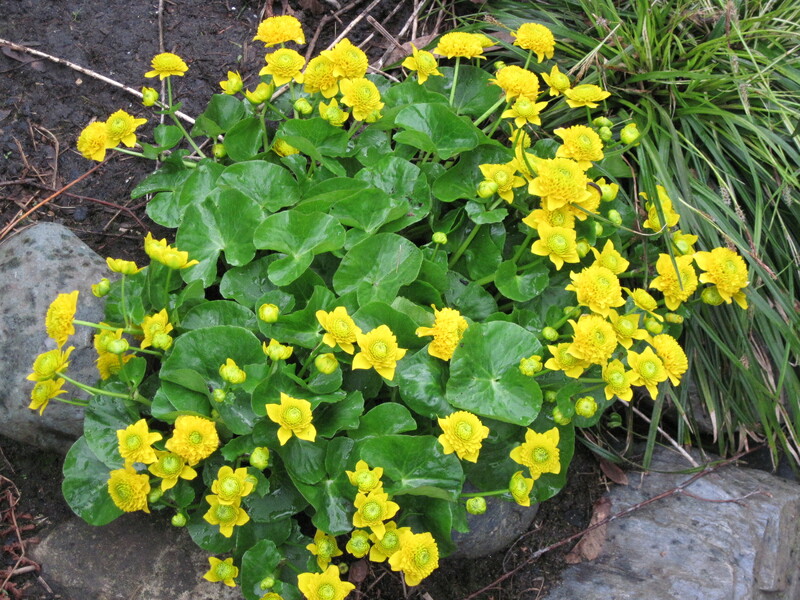 The soil will dry out, making it harder to extract the weeds, and the job will end up being done in warm weather instead of these cool, damp days which facilitate weeding. Or so I tell myself on the way to the shed to get the hand fork and dandelion tool. Spring is like getting up after a long night’s sleep. You are rested and want to get going, but it’s still an effort to flap back the blankets, put your feet on the floor and head for the bathroom. It’s so easy to go back to sleep for another hour and dream about roses in bloom and a mist of blue poppies in summer shade. Those things won’t happen unless you, the gardener, overcomes inertia and participates in their making. So get out of that chair, put those boots on, get out and dig!